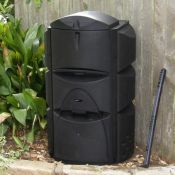 The EasyGrow Greenhouse comes with everything you need to get your greenhouse up and running, hassle free. 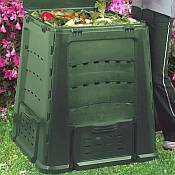 The 8x12 EasyGrow Greenhouse is 8ft wide, 12ft long, and 7ft 6 inches in height. The frame is made of heavy gauge extruded aluminum, beautifully painted a powder coated finish of Forest Green. The walls are made of 4 mil twin wall opaque polycarbonate. 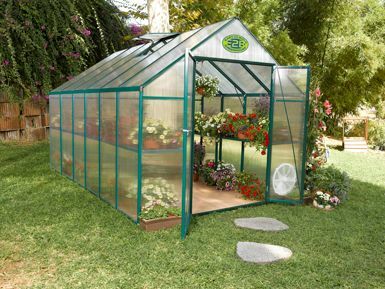 EasyGrow Greenhouses provide UV protection, excellent light diffusion, proper air circulation, heat control, and simple push-fit assembly that requires only a Phillips screwdriver and Pliers for assembly. 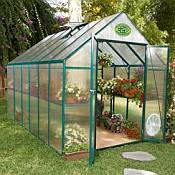 The 8x12 EasyGrow greenhouse kit comes standard with double doors, circular side vents for proper air ventilation and roof vents with an auto opener for each vent. The greenhouse does not need to have a flooring as the construction of the green house has criss cross steel wires that make it very sturdy.